I am a Certified Wine Educator with the Society of Wine Educators in Washington DC. 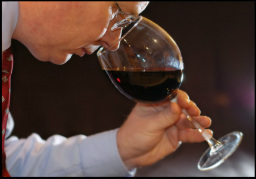 This is the highest educational wine qualification available in USA and requires considerable knowledge and tasting skills. I love to share my passion for wine with others. Wine is a fascinating subject but should never become "highbrow" or academic. I believe that knowledge can enhance the enjoyment of wines, but ultimately the only test that matters is whether you like it. I am passionately AGAINST the idea that wines can be assessed by a mathematical formula and rated by a number. Can anyone really tell the difference between a wine rated 91 points and another 92? I have been fortunate to visit many wine producing areas in the world and a small selection of my photos can be seen here. in 2011, my wife and I embarked on a month-long road trip across the country, visiting wineries in as many states as we could. Check out my blog. I am the owner of CLARITY, providing curated wine experiences worldwide.